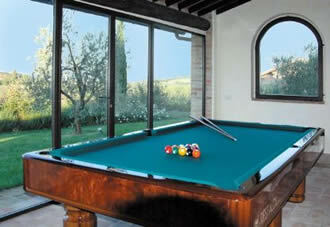 Billiard table villas for your holiday in Italy. Houses with their own billiard table. Challenge your family and friends to a game. Or a tournament! We now have over 20 villas with billiard table. We have started to upload them, but please contact us here for a full list. Or let us know your dates and specific requirements. Take a look at our selection of properties and check availability online. Got any questions? Contact us here. Villa holidays Italy: self-catering holiday accommodation in Italy, travel information, Italian lifestyle and much more!